The BIPOLAR ORBITARIS offers precise coagulation, powerful grasping and better cutting with the added advantage of a rotating handle that allows the hand to be used in the most comfortable position rather than with the wrist at an angle during surgery. The design uses a mechanical double hinge (like the Powergerip), so the jaw power is generated by the surgeon’s hand action. A very high pressure during grasping and cutting enables precise coagulation of the tissue. The jaw opens and closes only with your hand movement so you are in complete control. This design extends the application of minimally invasive bipolar coagulation. ORBITARIS bipolar forceps with a new innovative 360° rotating handle in relation to the shaft. Result: The surgeons hand can maintain a relaxed position at all angles, so ease of use and comfort (hence patient safety) has been enhanced over standard handles during the demands of minimally invasive surgery (MIS). Also available with lock to maintain rotated position. 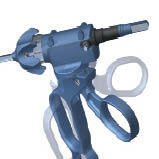 The extended flanks on the electrode shaft enable single finger control over the full 360° rotation of the electrodes. The shaft and the electrode are inserted and locked into the handle with a click stop, as in the well proven POWERGRIP bipolar forceps. The electrode inserts of the POWERGRIP are fully compatible with ORBITARIS, so upgrading to the enhanced ergonomic handling of ORBITARIS is economical. The ORBITARIS can be supplied with an ergonomically positioned locking device that can be operated by both right- and left-handed users enables the surgeon to lock the rotating handle in the chosen position. Just as easily, the locking device can be disengaged in order to move the rotating handle to a new position. For these electrodes a new type of insulation coating is used – “P-Coat”. This ultra-thin coating enables the insulation of the joints and the external surfaces of the jaws without any negative impact on their mechanical rigidity. This allows the surgeon to work very safely by ensuring that coagulation current is only applied to the chosen tissue and not the surrounding area. All P-Coat electrodes are fully compatible with both the ORBITARIS and the Powergrip bipolar instruments.